All this talk of Blu-ray DVDs has really made us nostalgic. Back in our college days in Washington, DC, we would occasionally trot off to Orpheus Records in Georgetown to peruse the vinyl for old rarities and anything else that caught our eye. A wonderful place to spend some time with other music lovers. When the vinyl business started going south, Orpheus Records moved across the Potomac to Arlington, Virginia and managed to hang on as big box retailers grabbed market share, MP3's and iPods proliferated, and web music sites flourished. 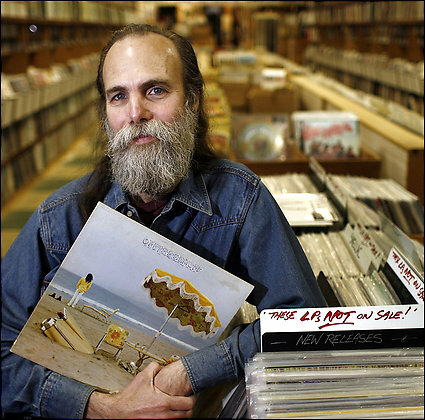 So it was sad news when we learned that our acquaintance Rick Carlisle at Orpheus Records would be closing shop. Bummer. As business faded, Rick didn't want to operate a web site. It was too impersonal and he liked talking to people. Rick is quite a guy. And not just because he liked Neil. He'd run around the store in his bare feet and often could identify a song when someone would hum a few notes or sing a few lyrics. With over 120,000 records, Orpheus will be liquidating its stock. So if you're in the area, you may want to catch some bargains. And they do have Time Fades Away (which -- as you know -- is still only available on vinyl). Just remember: vinyl is final. To read more on the demise of an independent record store. I always thought it was cool when you peaked inside the OTB jacket that it had the design of the beach umbrella on the cover. You don't get that with the cD. Definitely, the packaging on most of Neil's original albums is fantastic. Especially all the liner notes that came with Tonight's the Night and, as you mentioned, the print on the inside of the jacket of On the Beach. Any news on Chrome Dreams II on vinyl? "Any news on Chrome Dreams II on vinyl?" I'm pretty sure that it's coming out this month. And by the way, it is awesome! I bought many records from Rick in DC and VA over the last 13 years, I would walk in there and hear Greendale or a Neil rarities disc, always a pleasure. His store is a favorite of a few of my friends and my girlfriend rebought a Stevie Wonder record there that isnt on CD and is dear to her. Small records in the DC area are a dying breed and its a shame to see this one go. Another small store/venue, Strangeland Records, recently closed its doors after only 2 years in Annandale. I know the owner there and even with a loyal following of kids and shows he says he couldn't compete.